The UC Collaboratory for Ethnographic Design | An interdisciplinary hub for innovative ethnographic theory and methodology across University of California campuses. CoLED is an interdisciplinary hub for innovative research on the future of ethnography and design, linking faculty, graduate students, and initiatives across the University of California system. The word Collaboratory links the words collaboration and laboratory. The Collaboratory for Ethnographic Design is a collaborative laboratory. That is, it is a common institutional space in which researchers work together and experiment with ethnographic forms and processes — both new and old — all with a shared sense of purpose. 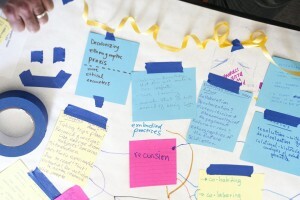 CoLED draws the term “collaboratory” from a conversation between scholars in 2007 and 2008 that led to a call for a more collaborative approach to ethnographic training and research design. One of the main ways in which they propose new approaches to research is through the creation of ethnographic “Design Studios” (as George Marcus suggests) and “Collaboratories” (in Paul Rabinow’s wording). The idea of a “collaboratory” was already in use in the design world when scholars started to use it to think about ethnography. Ethnography is a qualitative mode of inquiry into the social and cultural conditions of contemporary life. It is an open-ended form that adapts to the specificities of its research subject, and to the changing conditions in which the research is conducted. The method is distinguished by its commitment to participant-observation, and to long term and intimate engagements with its subjects. It is informed by and informs theoretical debates. It is a genre of thickly descriptive inscription that increasingly extends beyond print to include electronic media, performance, exhibition and activism. Rather than a set of handy and neutral techniques (participant-observation, interviewing, transcription etc.) designed to collect and analyze ethnographic “data,” ethnography is better understood as a craft, and as a particular mode of attunement to the social world. It is a reflexive and slow science that attends to uncertainties and contradictions over quick fixes. While ethnography began as a “salvage” science to gather data about “disappearing” cultures and their traditions under conditions of colonialism, imperialism, and capitalism, it is in fact particularly well suited for studying emerging social formations. Ethnographic methodology underlies work not only across the social sciences and humanities, but has increasingly been adopted outside academia, by health professions, corporations and non-governmental and activist organizations. There is no single way to characterize design. The word design can be a noun, a verb, and even an adjective. In general, to design is to create an intentional plan for the construction of an object, system, or method – and to do so in a way that considers form and function. Design means different things in different contexts. People design buildings, websites, cities, toothbrushes, computer systems, research protocols, clothing, furniture, and bureaucratic systems. In some contexts planning might seem like the most important aspect of design; in others the aesthetic side of designing something stands out. Designers might focus on form, intention, objects, systems, meaning, or style. Or they may take all of these into account at once. No matter the scale or mode in which it’s operating, design is always centered on creative action directed toward particular materials whose considered manipulation might, it is hoped, produce some sort of meaningful effects — even if those effects are not always foreseen in the process. CoLED explores the way that the term “design” has, in recent years, circulated in ethnographic work and in conversations about ethnographic methods. Design ethnography has a unique history in that it bridges two distinct histories of thought: research design – processes with the goal of contributing to academic theory, and design process – research with the goal of creating innovation by envisioning different futures. Some scholars have argued that much of the work that has been published about design ethnography focuses on how ethnographic methods, as developed in academic research, can serve the goals of design practice in business and for-profit settings. CoLED leans in the opposite direction. That is, the CoLED space is concerned with translating design principles back into the service of innovative ethnographic research and theory in academic settings.